Thanks to the wonderful art of Mike Cressy and the graphic wizardry of Gwen Whiting we’re gonna have a show! Photo by Gwen Whiting of the exhibit banner at the Washington State History Museum in Tacoma. 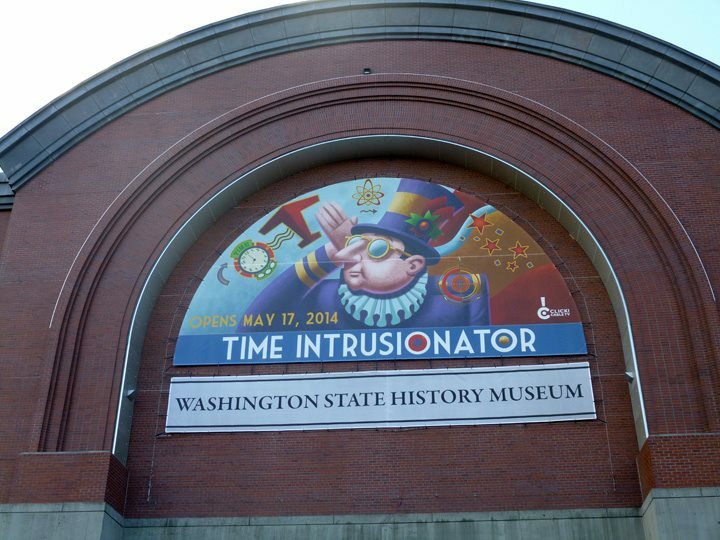 A number of people have asked me just what this “Time Intrusionator” exhibit is all about. Even more so since the giant banner went up on the Washington State History Museum building. 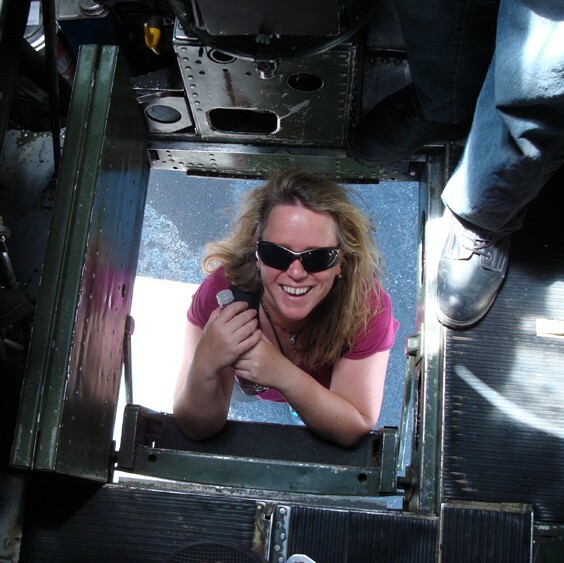 So I’ve decided to post a few “insider” scoops here on my blog to keep folks in the know. I’m not sure where the story came from, perhaps it was somewhere in the deep recesses of my imagination, in a place where “intrusioning” is a real thing. One spark was probably a favorite book I had as a kid called The Boy Who Could Enter Paintings. Another was the realization that Ernest Oglby Punkweiler is essentially my alter ego. He had actually been invented years before as a guest “objectologist” for our WSHS publication COLUMBIAKids. I wondered what he would have been like as a kid. The story is the result of that contemplation. About the time I was dreaming up Ernest, a request for more kid-centered exhibits was made by the museum where I work as the Head of Education. I proposed the exhibit and submitted the story to Soundings Literary Review. Both were accepted. The story, in its original form, was published in the magazine’s 2012 Fall/Winter issue. Now, two years later, here comes the exhibit! As many publishing folks know, sometimes the most difficult aspect of publishing is finding the right images to go with a story. I lucked out. In times of economic “flushity” the museum would normally hire an illustrator to create illustrations as an expensive work for hire. I didn’t have that luxury (our budget was slashed 40% in the couple years prior and still hasn’t recovered). So I turned to the Society of Children’s Book Writers and Illustrators’ Western Washington chapter and reviewed artists’ websites for possibilities since it is much less expensive licensing existing work than commissioning brand new art. Plus, you know what you’re getting. In scanning the various artists’ portfolios, I found about 15 images that correlated to objects in the WSHS collections as well as moments in Northwest history. Additionally, I was lucky enough to find my vision of The Keeper in the fabulous work of Mike Cressy. I contacted him and asked him if we could use his work, tweak it all over the place, and if he could draw “that one guy” as a kid. Mike did, and little Ernest was born. Couple that with the final cut (15 down to 8) of wonderful artwork from Jo Gershman, Craig Orback, Julie Paschkis, Richard Jesse Watson, Karen Lee Schmidt, Tucker Sharon, Paul Owen Lewis and the graphic wizardry of Gwen Whiting and we have a fantastic journey through time. Reproduced as large-as-life “sets,” each artwork allows the visitor to become part of the moment—to in fact, “intrude” and consequently “intrusionate” in time. What, you ask, is “intrusionating”? For a deeper description, you’ll have to wait till the next blog post. In the meantime, do use your imagination. Thank you so much for this exhibit and book. I read the book to my 4 and 6 year old grandsons who were visiting from Boston on the night they arrived. The next day I took them to the museum without mentioning the book. They were delighted and excited to see the intrusionator’s image: “That’s from the book!”. They spent hours in the exhibits looking at Ernest’s collection. I tell everyone about the experience, well everyone with a child or grandchild of appropriate age. Thanks again, great work.